We would like to announce the safe arrival of Sophie Alison Barker, who arrived very quickly at 12:41 on Tuesday the 13th May 2008, which is 13 days over due! Narelle was induced at 7:30am and was progressing slowly until 11:30 when she pronounced 1cm dilated (and the colour of the walls, which was gray), at 12:15 Narelles waters broke and in less than thirty minutes (and with no pain relief) Sophie was in Narelles arms. 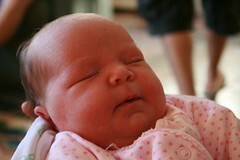 Sophie weighed 3.830Kg or 8lb7oz in the old scale, a decent size and a little bigger than Charlotte. 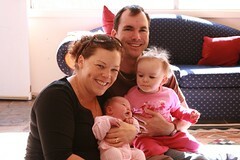 Narelle is doing very well, she was up and moving that night. We could have gone home earlier; however with Narelle feeling very tiered she took advantage of the nursery and got some well deserved sleep. We ended up leaving the Hospital early Saturday morning. The Alison part of Sophie’s name comes from Daves Grandmother who was Margery Alison. Charlotte has been very good and a very caring big sister. She has been trying to kiss Sophie and help pat her on the tummy to settle her. Charlotte can say “So” for Sophie and knows that she is her sister, which is said something like “sis’a” (missing the ‘t’ sound). Check out the photos here. 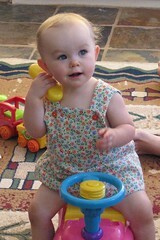 Before we knew it Charlotte has turned one! It has been an amazing year we have achieved so much yet we have so much farther to go. Some photos of the big day can be found here. The photo left is Charlotte on one of her presents with the toy phone, She puts this up to here ear and attempts to say Hi, very cute. 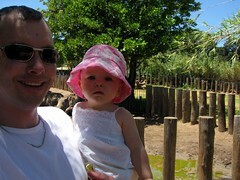 At the beginning of the year we took Charlotte on her first Zoo outing with Narelles Cousin and Family. Thanks to Mike, Gemma and Leuca for a great day out. Check out the photos here.